Latvia’s Prime Minister Laimdota Straujuma sacked a member of her government after he defended his intention to attend a pro-Nazi rally in the capital Riga. 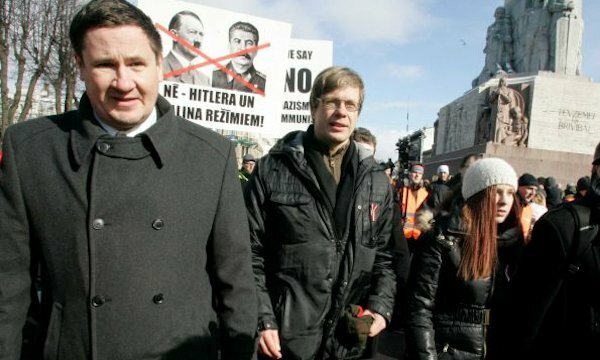 Environment Minister Einars Cilinskis of the rightist National Alliance participated in the annual march of Waffen-SS veterans and their supporters. About 1,500 people attended the event on Sunday, which has been held in the Latvian capital for nearly two decades. Cilinskis ignored a government order that no minister should attend the march and declared on Friday that he would be attending the rally. Straujuma’s spokesman, Andis Blinds, said that the PM had “no choice but to dismiss Cilinskis “in view of the “particularly sensitive” situation in Ukraine, according to a report by the ‘Associated Press’. Straujuma had given Cilinskis “time to reconsider his participation, but unfortunately he decided to participate,” Blinds said. The annual parade commemorating Nazi collaborators during World War II has not been banned, however. The veterans, who fought alongside Nazi German troops during World War II, walked through the Latvian capital to lay flowers at the Freedom monument. The parade was protected by guards from a private security company. Cilinskis said a “nation that does not respect its heroes has no future." The gathering near the Freedom monument was opposed by several dozen activists chanting anti-fascist slogans. A sharp argument exchange took place between the two groups, but a heavy police presence prevented any kind of violent clashes.